Click the "Message alerts" icon at the top of the page. Next click "Go to Internal Messaging," then "Settings." 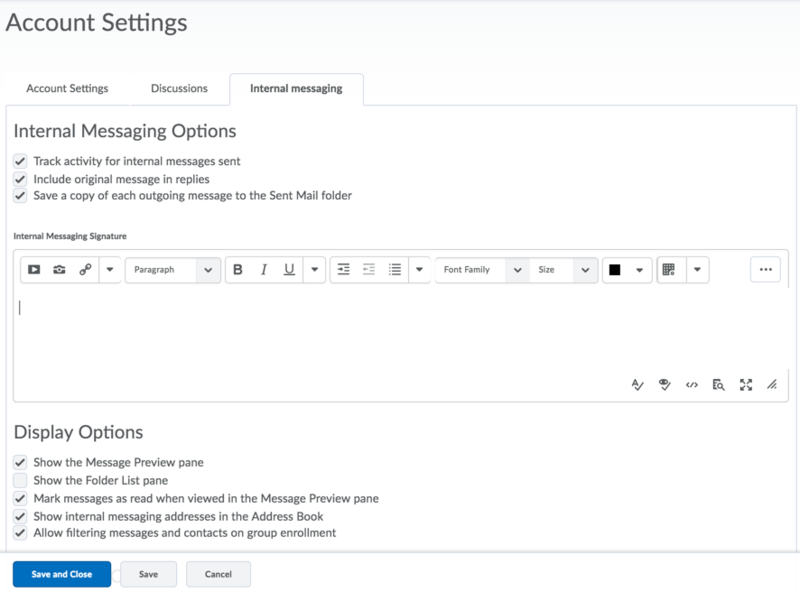 Or, you can select "Internal Messaging" from the Communication drop-down menu at the top of the page, then "Settings." Activate "Include original message in replies" so you can follow message conversations. Be sure to use your online course's internal messaging tool for all private messages to your instructor. Please note that this is an internal messaging system, and can only be used from within the course. No external e-mails can be sent using the D2L internal messaging tool. Be sure to check and read your course internal messaging regularly. Always be sure to include your name, the name and number of your course, and the topic of your message in the subject line of any e-mails that you send. If you are experiencing a technical problem, call the 24/7 Help Desk at 1-888-800-9198 (toll free number). Posted by: Amy Sorensen - Tue, Mar 29, 2016 at 12:39 PM. This article has been viewed 83864 times.